The keto diet doesn’t have to be complicated if you’re vegan. 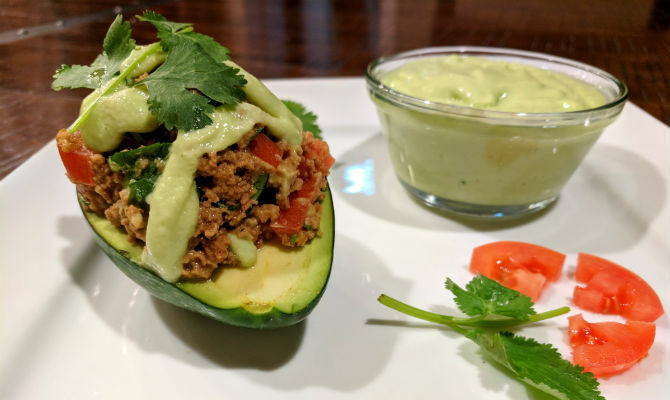 These vegan keto stuffed avocado tacos are keto and vegan-friendly, but best of all they taste like a dinner win! Peel two of the avocados and remove pits. Cut them into chunks. Put the chunks into a blender along with 2 tablespoons of lime juice, 1 teaspoon minced garlic, 1 tablespoon chopped cilantro, and ½ cup almond milk. Blend until dressing is creamy and smooth. Add more almond milk to desired thickness. Set aside. Prepare the TVP by placing it in a medium-sized mixing bowl along with hot water, chili powder, cumin, paprika, garlic powder, and sea salt. Mix the ingredients together and let sit so the TVP can soak in the water and spice flavors. Slice the remaining four avocados in half and remove the pit. Leave the skin on. Cover exposed avocado with part of the lime juice to prevent browning. In a separate mixing bowl, mix together the chopped tomatoes, jalapeno, remaining cilantro, coconut oil, and remaining lime juice. Once the TVP is ready, fluff it up with a fork and combine with the tomato mixture. Mix together. Place TVP mixture inside the hollow of each avocado. Make sure to heap it so it is a liberal serving for each avocado. Drizzle with the cilantro lime dressing and garnish with a wedge of lime, halved cherry tomatoes or chopped Roma tomatoes, and a bit of cilantro.